Spring sculpture planting season is back. After a winter of cold and snow, color is awake and flowers are opening. It's a good time to compliment nature with Art. 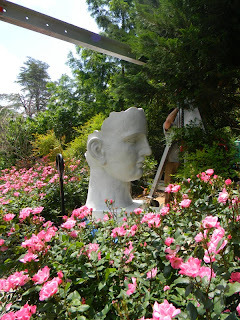 At home in the landscape, what Artists make can bloom too. 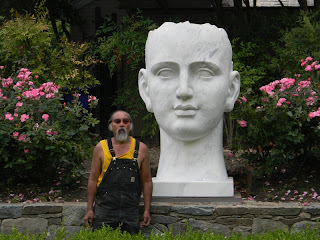 Because I am a stone sculptor, I'm lucky and I get to work with other stone sculptures. Most art handling companies decline these opportunities for obvious reasons: liability and danger. People have gotten hurt and the Art damaged. Specialized equipment is only a first step, how to use the tools and troubleshoot during the project is the Art part. Experience through the job is the least effective way to gain awareness. The practice of art handling, ideally, does not start with the client's work. As scale and scope increases, the ability to test skills diminishes. Who has objects that weigh a ton or more to play with? This project involved a stone sculpture purchased in Florida and transported to Md. 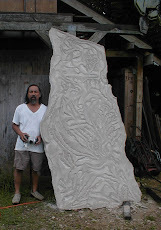 I was asked to provide an estimate based on size and weight of sculpture: 74" x 45" x 50" @ 3,200 lbs. I was told the installation would be straight forward and accessibility to the clients pedestal reasonable. They asked me to google earth the address. I saw where it would be placed and made a proposal. As the project moved forward and the delivery date closer, the client wanted to make sure I understood what was expected. Meeting him at his house, he showed me where and what he wanted. The pedestal was integrated into the edge of a stone retaining wall. The wall dropped 38" to the main landscape grade covered with decorative shrubs. Beside the pedestal careful roses showed off their spring flowers. Behind the pedestal there was a wall of wild plantings 12" above the pedestal level. Walking through the garden I asked if there was another way inside. The garden gate was only 32" wide. He said to come with him in his car to the house next door where the access would be easier. We drove up the driveway and he pointed through a wall of shrubs and small trees. We walked through them right to the waiting pedestal. He said OK, he'll have a small tree cut down and I could do what was was necessary to get through. I said OK.